Chortkeh BDF Font Viewer is a tool for viewing files in Glyph Bitmap Distribution Format (BDF) in Windows generated by different programs such as Microsoft SBIT32.exe (part of Microsoft TrueType SDK) and Mark Leisher’s TTF2BDF.exe / OTF2BDF.exe (OpenType to BDF Converter) et al. Chortkeh BDF Viewer for Windows is able to process BDF files including Unicode glyphs up to 64×80 pixels as of version 2.0. The roots of Chortkeh BDF Font Viewer return back to 2002, when it’s been started on January 8, 2002, as part of Chortkeh Font Toolbox. 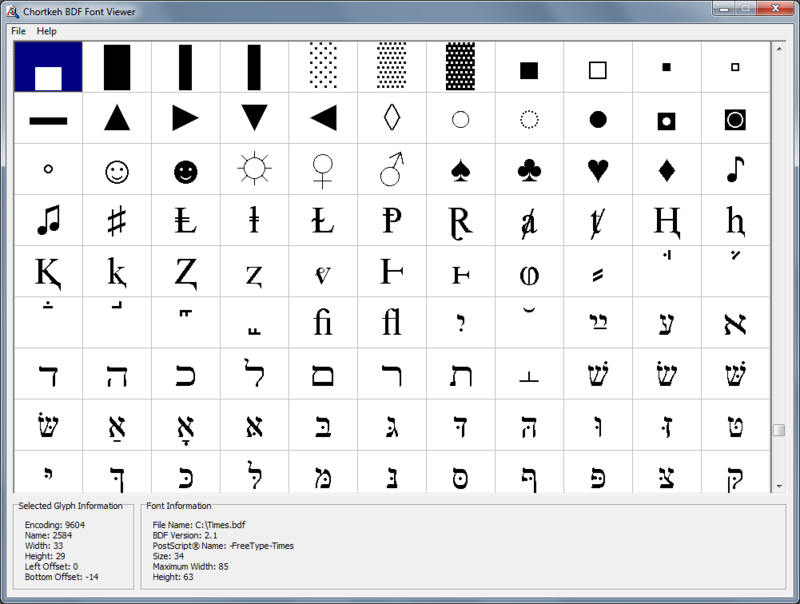 Chortkeh BDF Font Viewer is a stand-alone 32-bit portable executable (meaning no need to install, just run the single executable file) not dependent to any special API which runs smoothly on both x64 and x86 architectures of Microsoft Windows 10, Windows 8.1, Windows 7, Windows Vista, Windows XP, Windows 2000, Windows NT, Windows Me, Windows 98, and all Windows Server systems. This computer program is freeware, provided AS IS, with no warranties expressed or implied.